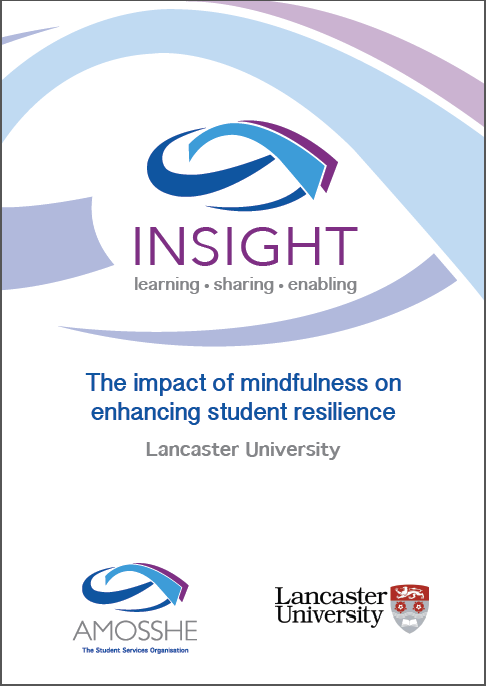 This project, undertaken by Lancaster University, investigates the impact of mindfulness training on student resilience, while evaluating two established approaches to delivering the training. Principal investigator: Claire Povah, Head of Strategic Development, Student Services, Lancaster University. Total award from AMOSSHE: £2,400. Mindfulness is not yet widely embedded into the higher education structure of the UK, in spite of recent research that points to the benefits of mindfulness for cultivating resilience. This project aims to evaluate the most effective approach to delivering mindfulness training to students, by measuring the resilience and wellbeing of participants. The project will review two methods for delivering mindfulness programmes (face-to-face and online) in order to evaluate the impact of these methods on students’ resilience. The project team will undertake desk-based primary research on mindfulness, and then develop scales for measuring student resilience. The mindfulness training methods will be tested on first year undergraduate students. One group of students will undertake face-to-face mindfulness training, while another group will undertake an online course. The project team will measure participant wellbeing, including of resilience before and after the research, following standard practices within the university and across the sector. Pre- and post-tests will be undertaken with both groups to evaluate the impact of the mindfulness programmes. An overview of mindfulness and its potential benefits for student resilience. A research report developed in conjunction with partners. A handbook for Student Services colleagues across the sector detailing how to develop mindfulness for student resilience within their institutions.